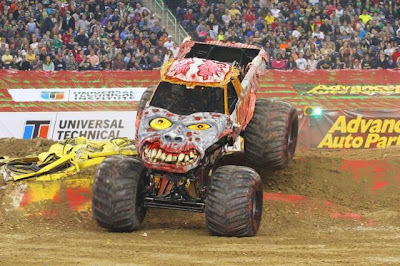 Don't know how I almost missed this one, but the Advance Auto Parts Monster Jam is March 2 at Ford Field in Detroit! I was surprised Maggie enjoyed her first one a couple years ago as much as she did, but since then we try not to miss it. Want to meet us there? Use this link to get FOUR tickets, FOUR hot dogs and FOUR sodas for $100! This is the truck called Zombie (hard to believe I picked this picture to post, eh? ;) ). I know I've seen stuff coming up at different Auto Zone stores as well as Lowe's - be sure and share your local events. They're usually a great, free way to get up close and personal with these giants! Joel has been bugging me to go, might have to make the trip! When are you going?